Keith Martin of Chicago shows off his June 28 catch — a 36-inch snook — at the Rod & Reel Pier. Daughters Emily, Abby and Gracie proudly pose with dad before the trophy fish was released. College friends Matt Crook of Tennessee, Cleavland Covington of New York, Carolyn Browning of New York, Tate McNeilly of Tennessee, and Ashley Patton, and Doug Foote both of New York show off their June 20 catch. The group met to catch up while on a break from work and to go fishing with Capt. Warren Girle. 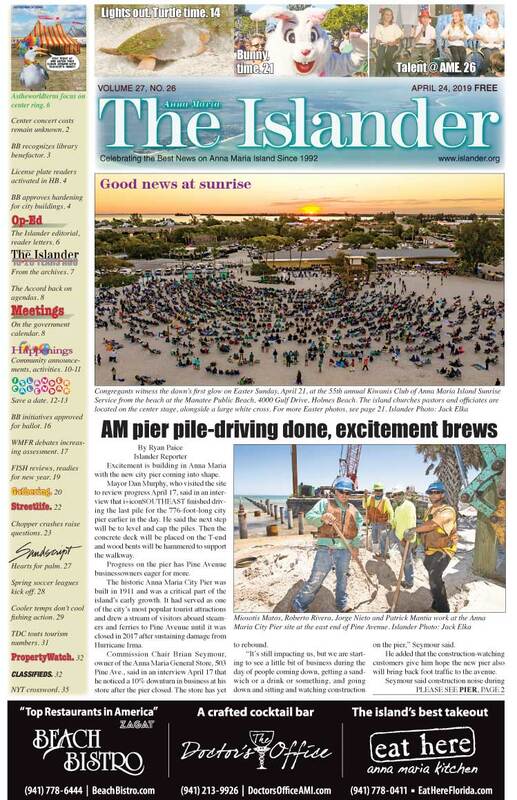 They used shiners in Sarasota Bay to catch their trout dinner. Foote earned the group MVP award on the fishing trip. 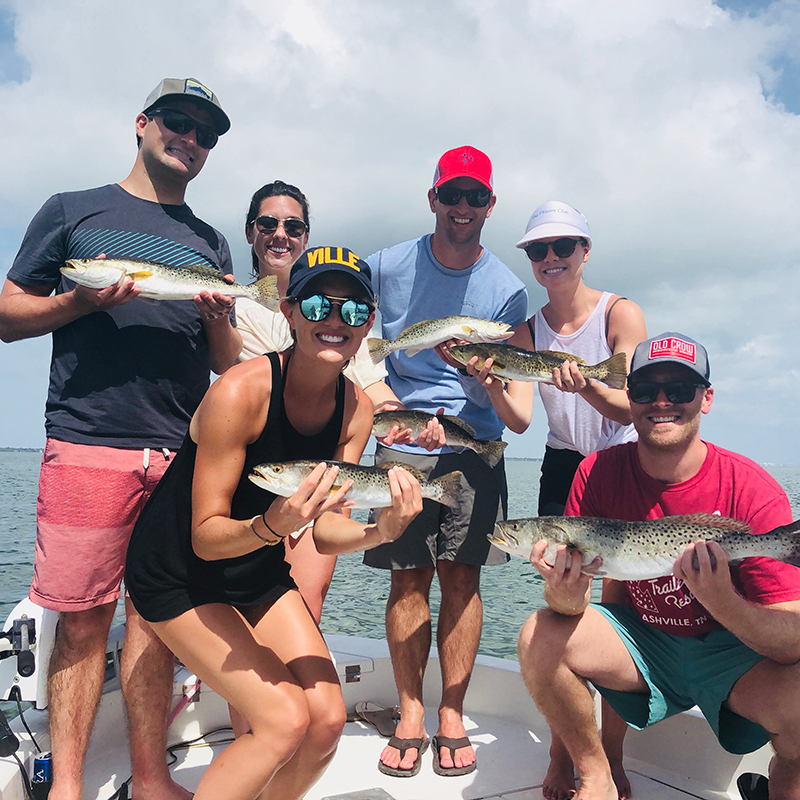 With near perfect weather, fishing around Anna Maria Island is proving to be stellar — especially at the Rod & Reel Pier on Tampa Bay. 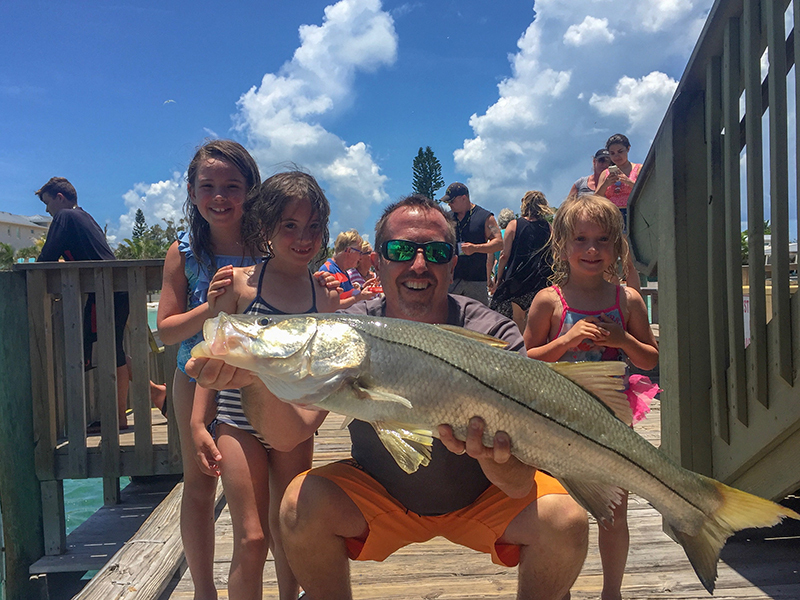 Clear, emerald green waters and light breezes from the west are the perfect recipe for fishing at the R&R and the catch-and-release snook bite is happening right now. After numerous days of running charters, I finally had a day to spend with the family, and my wife Bekka and daughter Izzy wanted to spend a day at the beach and go snorkeling. Although I had been out fishing in the heat for days, I was excited to spend a morning with them. However, I still needed a fishing report from Jim Malfese at the Rod & Reel Pier. So I suggested we go out there and, while they snorkeled the rocks by the pier, I could visit with Malfese. We loaded up the truck and went to Anna Maria — Island that is. Swimming pools and fishing piers. Boy, kinda sounds like the “Beverly Hillbillies” huh? I guess that fits since we now reside in Bradentucky. We arrived at the R&R and got the last parking spot, which saved me from having to drive up and down side streets trying to park “between the signs.” We had calm waters and cool breezes awaiting us. The girls found a spot on the beach and put on their snorkel gear. I walked out to see Malfese and get his fishing report. The Rod & Reel is true to its name when the snook bite is good. Anglers stood shoulder to shoulder, casting large baits under the deck in hopes of hooking into a monster linesider. As I neared the end of the pier, I ran into Malfese. He was super busy keeping track of fishers. After our hellos, he got right to the point with his fishing report. I followed him around as he ticked off what was being caught and, aside from the normal action on Spanish mackerel and mangrove snapper, he said anglers were hooking up plenty of big snook. I left him to his job and walked around the pier for a look. Upon rounding the corner, I recognized Keith Martin, a buddy from Chicago. He was at the pier for the snook. We sat and made small talk as he acquired a large mojarra from one of the other anglers. Mojarras — especially ones 12-inches long — make excellent snook bait. Within seconds, Martin stabbed a large 6/0 hook through the nose of the fish and lowered it under the pier, where the tide would push it back along the pilings. This is where the big snook lay waiting for an easy meal. We talked a little longer about this and that as the bait swam under the pier, not knowing that it soon would be lunch for a big snook. Then Martin stopped mid-sentence. “I just got bit,” he whispered. After a slight pause to let the fish eat the large bait, he reared back and set the hook. The rod bent over double, with the tip going under water. He pulled up with all his might and the fish surfaced. He was still under the pier so there was no visual confirmation, but there sure was a lot of splashing and commotion going on. In fact, water splashed upwards through the planks on the deck. A crowd of spectators gathered, suddenly, the hook pulled out. Well, he finally did get one on the deck. In fact he got plenty — ranging from 36-40 inches. Not bad for spending a morning relaxing at the best place on Earth — the Rod & Reel Pier. 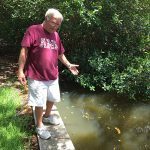 Malfese says heís is seeing a variety of species being pulled from Tampa Bay in addition to the catch-and-release snook — which are ranging up to 40 inches in length. Casting large baits, such as ladyfish, mullet or pinfish under the deck is resulting in some phenomenal battles. Stout gear is a must, as anglers must be able to wrangle these big fish out from among the pilings before the fish pulls the line through the barnacles to cut off the leader. Other catches include mangrove snapper, whiting, Spanish mackerel and ladyfish. Flounder, redfish and an occasional pompano also are taking the hook at the R&R. Capt. Aaron Lowman is spending most of his days fishing inshore and nearshore structure. Fishing around reefs in 15-40 feet of water is producing a variety of catches for Lowman’s anglers — including mangrove snapper, Spanish mackerel and blacktip sharks. An occasional cobia is making a showing for lucky anglers, too. To get this bite started for his clients, Lowman is heavily chumming the waters with frozen and live chum. Moving onto the flats, Lowman is targeting spotted seatrout. This bite is best during strong incoming tides, when Spanish mackerel and bluefish are in the mix. Capt. Warren Girle is running charters offshore to cash in on the mangrove snapper bite. Bottom fishing with live shiners is attracting limits of fish to Girle’s boat, with most catches 15-18 inches. While targeting snapper, Girle is putting clients on numerous juvenile gag and red grouper. Spanish mackerel are being found at offshore structure eating free-lined live shiners fished on the surface. Moving inshore, Girle is putting his anglers on redfish, spotted seatrout and catch-and-release snook. All three are being caught during morning tides over grass flats in 3-6 feet of water — shallow for the snook and reds, deep for the trout. Capt. 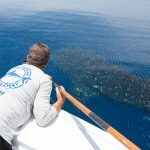 David White of Anna Maria Charters is migrating out to deep water to escape the extremely warm inshore waters. In depths of 100 feet or more, White is hooking up with African pompano over wrecks and reefs. While fishing ledges and hard bottom, White is putting anglers on numerous red grouper, as well as some respectable-sized mangrove snapper. Capt. 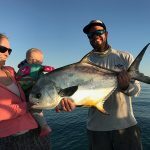 Jason Stock is again taking care of the permit bite while fishing offshore wrecks and reefs. Casting live crabs to these fish as they school on the surface is providing action for Stock’s clients. Permit up to 25 pounds are being taken in this fashion. Also while offshore, Stock is putting clients on mangrove and yellowtail snapper, Spanish mackerel, goliath grouper and a variety of shark. When fishing inshore along the beaches, Stock is putting clients on tarpon and some big catch-and-release snook.